It's no exaggeration to say that the Japanese economy is dependent on China's tremendous economic growth. 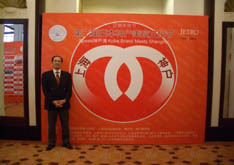 Companies in various industries have set up operations in China in pursuit of skilled, low-cost labor and a huge market. And as China's trade has expanded, its logistics business has become more diverse and more complicated. At Japan Express, we draw on our accumulated experience to create optimum logistics systems tailored to individual customer needs. Shanghai is a historic city known as the "Paris of the Orient" in the early 20th century. 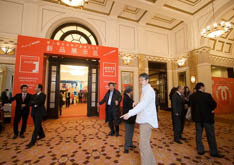 Today, Shanghai expresses the bottomless enthusiasm that drives rapidly growing China. The passion of our office echoes through enigmatic Shanghai. As the "world's factory," China's trade pattern focuses "processing trade," in other words, imports of raw materials and exports of products. In many cases, Japanese companies that set up production facilities in China tend to manage business and logistics operations from Japan while taking advantage of processing trade in China. Door-to-door intermodal service that links China and Japan is the fastest, most efficient way to supply raw materials and transport the finished products. At Japan Express, we can respond to any customer request for shipments from designated sites in Japan to their destinations in China. When a company in Japan does intermediate trade (offshore trade), selling the products made or procured in China to a third country, direct transport from China to the destination country can be conveniently arranged. However, the cargo must clear customs in two countries, so documentation and procedures are more complicated. The Japan Express network is expanding in China and other nations around the world to meet every customer's needs, including arrangement of B/Ls and other documents in China. When importing Less than Container Load (LCL) cargo from several suppliers in China, traders often find that the transportation arranged by the suppliers, is not cost-competitive nor easily manageable. To streamline the process, we recommend consolidating LCL cargo into Full Container Load (FCL) before loading in China. At Japan Express, we call this "buyer's consolidation service." We are entrusted by our customers to contact their suppliers and consolidate their LCL cargo. Goods produced in China under the processing trade system must be exported to be eligible for the system's benefits. However, as corporations become more globalized, we see more cases in which products originally intended for sale in Japan or a third country are drawn back to China's domestic market. In these cases, goods produced in China and sold in China do not comply with international trade regulations. However, exporting the goods to Japan and re-importing them to China to meet trade processing requirements wastes time and money, and may even compromise the safety of the cargo. The "bonded logistics zone system" was formulated to address this problem. The main function is to identify products that were once delivered to the bonded logistics zone as "exports," and those sent out of the zone as "re-imports." This capability significantly reduces logistics costs, saves time, and allows exporters to quickly submit claims for value-added tax refunds. Along with Japan Express, Mitsui O.S.K. 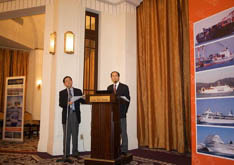 Logistics, another MOL Group company, was one of the first companies to start operation in Shanghai's bonded logistics zone. Working closely with MOL Logistics, we serve as a logistics coordinator to help customers take full advantage of the bonded logistics zone. Non-resident customers can own assets as overseas inventory in China by using the bonded logistics zone. 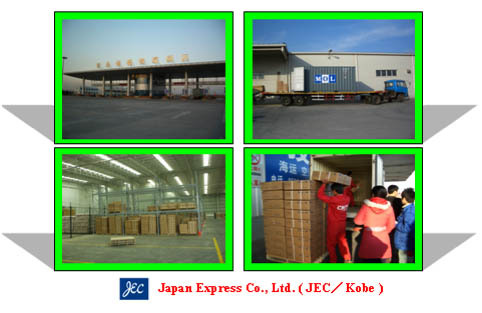 Japan Express is entrusted with non-resident inventory control in the bonded logistics zone in Qingdao, handling procedures for bringing in (export)/out (re-import) and storage operations. What's more, customers can monitor inventory control status from our Web site. Interest in Japanese food and food safety is growing rapidly in China, especially among more affluent citizens. The city of Kobe takes advantage of this opportunity, inviting local sake brewers and confectionery companies to participate in a food fair called the "Kobe Japanese Gourmet Culture Festival" in Shanghai. The goal is to make the Port of Kobe an export base for Japanese foodstuffs bound for China. This transport route is called the Kobe Food Fresh First (KFFF) Road, and the city has aggressively promoted exports of Japanese foodstuffs to China. Japan Express plays a key role in this foodstuff export model business, overseeing international trade infrastructure service (kangoufu.com) including online orders/receipts and transport system. 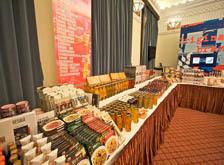 "The 2nd Kobe Japanese Gourmet Culture Festival"
A rough sketch of the foodstuff export model. Members are allowed to have the international trade infrastructure service. ©2010 JAPAN EXPRESS CO., LTD. All Rights Reserved.